Getting the best deals and earning cashback rewards is a marriage made in heaven. You will be racing down the aisle to get your hands on a host of great offers, whether you are shopping for wedding dresses, suits, catering, gifts, venues or honeymoon destinations. Buy contemporary jewellery at Monica Vinader. 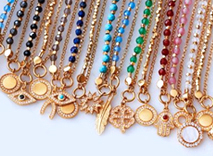 Browse earrings, rings, friendship bracelets and necklaces. View personalised gifts and earn cashback. Cover weddings or civil partnerships with Weddingplan Wedding Insurance. Cover against cancellation, rearrangement, loss or damage and earn cashback.